Ideal to be stowed away in confined spaces, the Basic HSE Economy Container (Empty) range provides you with the classic green first aid case to store away all of your health and safety materials in the workplace or in a public area. Practical in design, the Basic HSE Economy Container is fit to the standards set out by the Health and Safety Executive, and ensures that you store your resources in the most efficient manner possible. Give your employees and colleagues peace of mind by displaying one of these cases on your site. These cases feature all the robust strength and durability of the Basic HSE Essentials range, with an integrated carry handle for easy transportation. Made from strong polypropylene, this case ensures that any contents stored inside are protected from external elements such as dust or moisture. 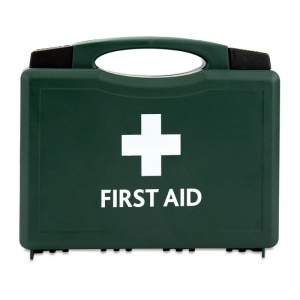 Each Economy Container is a recognisable dark green, as is standard for most basic first aid kits, with the familiar first aid logo printed on the front of the case. The box is available in two different styles, depending on the size of kit you require for your working environment. Please see the sizing chart below for more information. These boxes can easily be stored away freestanding in your designated first aid areas, however the Aston case is also available to be wall mounted using a Bulkhead Wall Mounting Bracket (sold separately). Please note that the Basic HSE Economy Container is sold empty and first aid supplies must be purchased separately. The Basic HSE Economy Container (Empty) is usually dispatched via First Class Royal Mail and delivery should be within 1 to 3 working days.